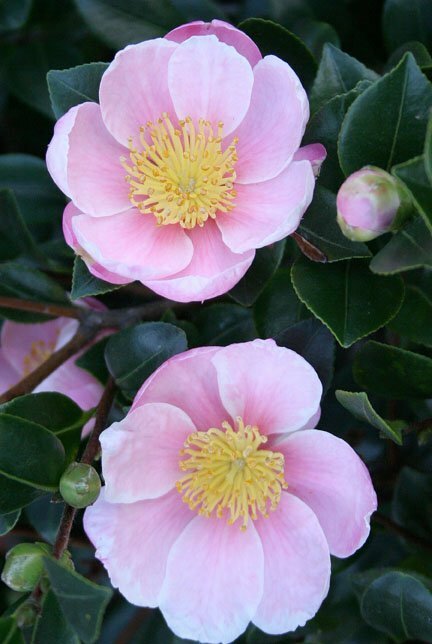 A sport from the extremely popular red Yuletide Camellia, its blooms are pink, centered with bright yellow stamens. Pink Yuletide is fragrant, and a beautiful addition to the winter garden. An excellent choice for a colorful hedge or screen, espalier, or border shrub, this moderate grower will reach eight to ten feet tall and wide. Does well in a container, too. A mid-season bloomer (October through December), Pink Yuletide prefers filtered sun and regular watering, weekly or more often in extreme heat.